While this blog is about New York City, I preface it with how I came to have an interest in the Interstate Highway System. As a child growing up outside of Chicago, I lived by two interstates, I-55 and I-355. I knew they had to be related somehow; what are the odds that roads with such similar numbers intersected by accident? I thankfully found out all one would need to know about the Interstate Highway System and US Routes in general from late-90's and early 00's websites like AARoads.com, Kurumi's 3-digit interstates page, and the International House of ZZYZX. Each had some very highly detailed information on what I was looking for, and would be the catalyst into the beginnings of my roadgeekery. Indeed, I-355 was a child interstate of I-55, in that it spurred off from 55 in a much shorter route than it's parent. I was further interested in roads that were proposed, but never built, such as Chicago's Crosstown Expy, as well as completely decommissioned routes. I-78 ends in the Tribeca neighborhood, and doesn't connect to either of it's nearby child interstates. I-278 and I-478 (which only appears on maps and is the Brooklyn Battery Tunnel, or Hugh L. Carey Tunnel if you want to be official) should be children of I-78, yet they don't connect. 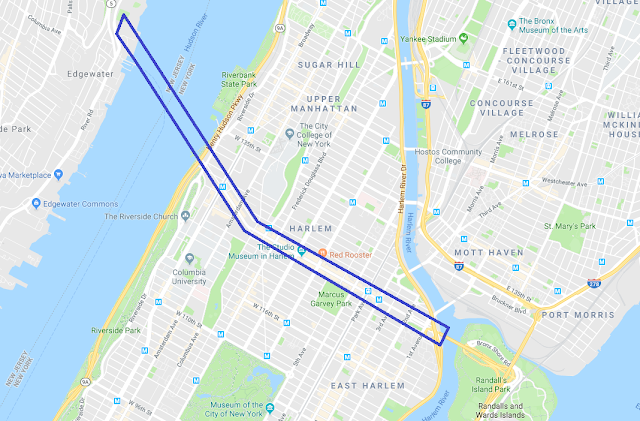 The reason for this is that there is a missing expressway that was planned, but met obvious community opposition, called the Lower Manhattan Expressway, or LOMEX. At the cost of leaving a small gap in the interstate system, 2000 homes and 800 businesses in SoHo (New York loves abbreviations for neighborhoods) and Little Italy were saved from demolition. 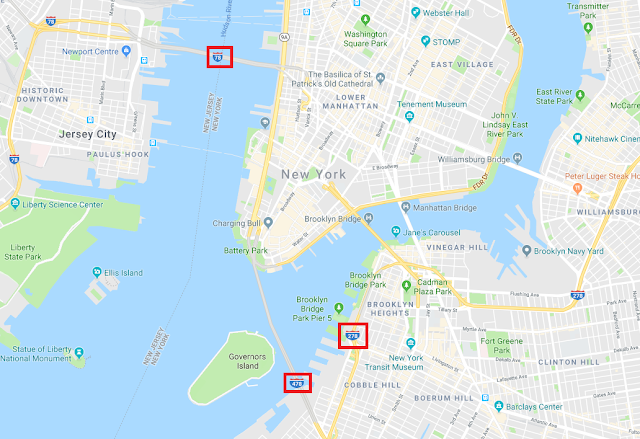 Had the LOMEX not been cancelled, the Manhattan Bridge would be known as I-478 instead of the Brooklyn-Battery Tunnel, and I-78 would have connected to each of it's children, including I-678 via I-278. But the LOMEX wasn't the only cancelled expressway in NYC, far from it, it wasn't even the only cancellation of the proposed I-78 route. Many of these were proposals by Robert Moses, who ultimately planned and designed many pieces of New York City's infrastructure. For today's blog, we're gonna take a look and examine some of these unbuilt expressways. The Bushwick Expy was an even earlier proposal, which would have connected the Williamsburg Bridge to the Nassau Expy (NY-878; more on that later). Using the right-of-way between Bushwick and Broadway in Brooklyn, it would have then crossed over to Conduit Ave using Atlantic Ave. You can even make out a route of the proposed expressway today on Google Maps, based on where wide boulevards seem to cut through the grid system. This expressway would have destroyed 4000 homes, double that of the LOMEX, and mayor John Lindsay voiced his opposition to the project in his re-election campaign in 1970. A substitute proposal, the Cross-Brooklyn Expy, would have connected the Verrazano-Narrows Bridge with the Nassau Expy, and it too was cancelled. And now onto the Nassau Expressway, and back to I-78 we go. 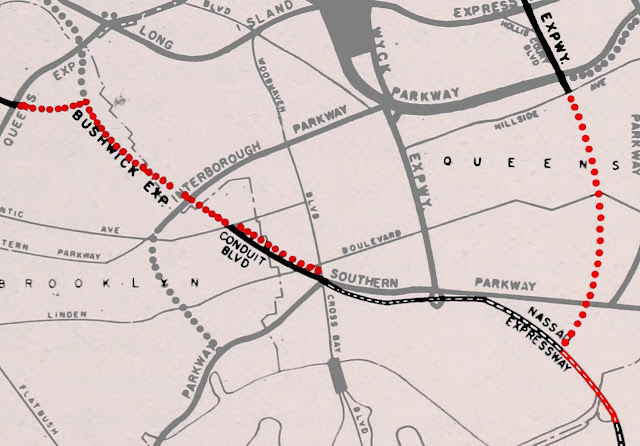 The unbuilt Bushwick Expressway would have connected to the Nassau's west end seamlessly, with the I-78 designation continuing as well. While none of the Bushwick was built, Eastbound lanes of the Nassau were, as it currently splits off from the Belt Pky to facilitate traffic into JFK airport. Thus, the I-78 gap was filled on the Nassau with the .7 mile long I-878, which was never signed given it's extremely short length. In 1991, I-878 was redesignated and signed as NY-878, and it's current status as an interstate is unknown. However, yet another unbuilt highway was supposed to carry I-78. East of the Nassau, I-78 was to continue further northeast onto the Clearview Expy (I-295) and the Throgs Neck Expy (I-95), but the Clearview was not built south of the Grand Central Pkwy. Rough ROW of the Clearview Expy, once destined to carry I-78 northeast. It is unknown if it was to continue on from there. Confused yet? I-78 is definitely the most confusing bit of unbuilt road in New York City. Thankfully, most of the other highway proposals are relatively straightforward. Each of the boroughs has expressway proposals that never came to be, as well as partially built expressways, such as Staten Island's unfinished Korean War Veteran's Parkway. Even some roads that were built, such as the Sheridan Expy, perhaps should not have been, at least to expressway standards. But the Sheridan was planned to be even longer than it ever ran, as one proposal had the road continuing north along Boston Post Road to connect with I-95 on it's north end via the New England Thruway. In the Sheridan's case, what was constructed is now being converted from expressway to boulevard, going from I-895 to NY-895 in the process. Let's take a look at Manhattan again, where many of the expressways proposed for the island came to be. 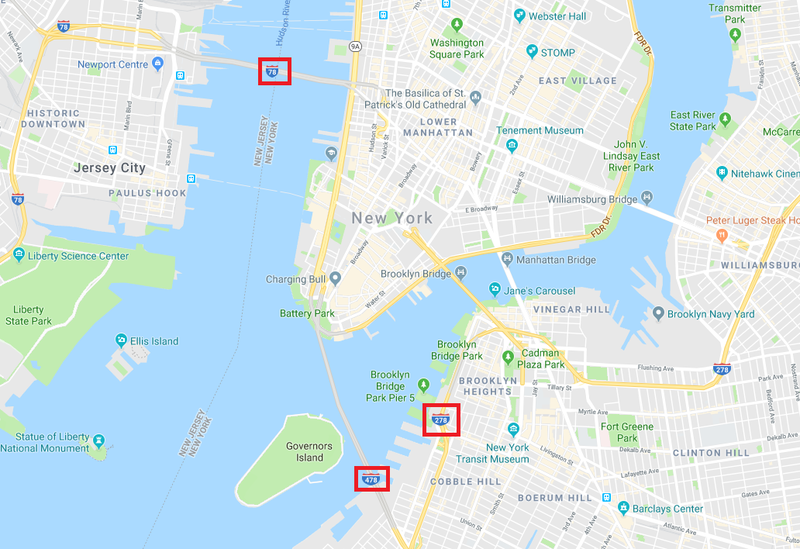 The Lincoln Tunnel and the Queens-Midtown Tunnel are on roughly the same spot on the grid, just opposite sides of Manhattan, and both are labeled Route 495 (NJ/NY 495 for the Lincoln Tunnel; I-495 for the QMT). This gap between the two 495's was to be the Mid-Manhattan Expressway. 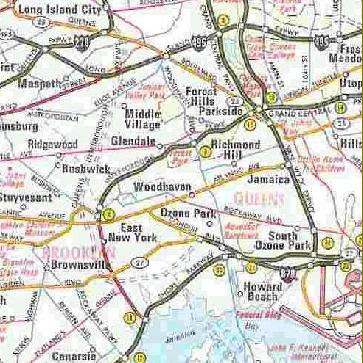 While New Jersey had I-495 shields as late as 1979, this project was cancelled in New York by 1965, creating the gap, and requiring New Jersey to decommission their 495 to a state route. Rough right-of-way of the unbuilt Mid-Manhattan Expy, which would have extended I-495 into New Jersey via the Lincoln Tunnel. Had Robert Moses got his way, the Harlem neighborhood in New York would be the site of an expressway linking the Triboro Bridge with Edgewater, NJ via the unbuilt Cross-Harlem Expressway (New York isn't particularly creative when it comes to naming expressway proposals). Cross Harlem Expy's proposed ROW. It is unknown what, if any number, may have been proposed for it. The Bronx was spared from further highway development along Gun Hill Rd, in which Route 164 was proposed to become the City Line Expressway, connecting the Major Deegan Expy (I-87) with the New England Thruway (I-95) & the Hutchinson River Pkwy. The unbuilt City Line Expy along Gun Hill Rd. 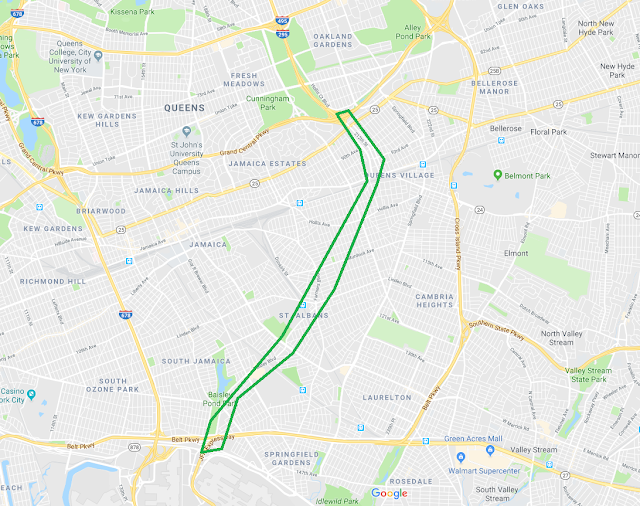 The Bronx River Pkwy currently ends at the Bruckner Expy, just north of Soundview Park, but was proposed at one time to extend further into Soundview, to an unknown location just south. On a related note, one road that was built and served it's time as an automobile road has since been converted to bike use only, the Vanderbilt Parkway in Queens was once part of the Long Island Motor Parkway, an early 20th century toll road and one of the first roads designed exclusively for autos, it would become a precursor to the boulevard, parkway, and expressway in it's design, despite being functionally obsolete rather early in it's lifetime. To me, these proposals are fascinating, and shows how many different ways the City of New York could look today under different political climates, and had people not spoken up about their opposition to expressways. Much like the abandoned railroad network and the scars they leave behind, I liken it to putting a puzzle together that's missing some of the pieces. Since you mention I-78 and I-278 not connecting in NYC, it's also worth noting that they were intended to connect in New Jersey as well. 278 never got extended beyond Route 1/9 in Linden, but at one point was planned to extend to 78 in Springfield Township, at the Springfield Ave interchange. Thanks for your comment and you are indeed correct. I wanted to focus exclusively on New York City with regard to expressway cancellations, but I perhaps should've included that somewhere in my I-78 paragraph. Perhaps I'll have to do another blog about cancelled expressways in New Jersey! Very interesting and thanks for posting!